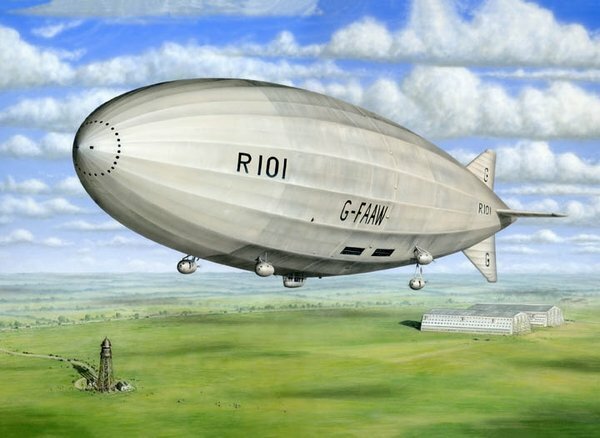 The British Dirigible R101 – The R101 was the last of the British dirigibles ever built. When constructed in the late 1920s she was the largest flying object ever made. Designed to link the far-flung corners of the British Empire within days, she was as big and luxurious as an ocean liner. In October of 1930, the R101 attempted a maiden voyage to India but crashed during a storm in France ending the British air ship program. This image depicts the R101 on the morning of June 28, 1930 as it departs Cardington for the Hendon Aerodrome air show where precisely on schedule, it droned over the area at 800 feet, dipping a salute to Prince George in the Royal Box.